Previously I have shared a detailed article about creation of Child’s user account in Windows 8.1 with a 4-digit sign-in pin. But it’s a common issue for parents that they want to stop their children from crappy and rubbish content available on live websites and also in software. Scam websites and fraudsters can trap children and children may provide any important information about their parents to these scammers. Also children can visit malicious and adult content websites by clicking on a link misleading everyone. Parental control is a necessity these days because of increasing number of illegal websites and software. This article is for parents who want to keep away their children from bad activities. Here you’ll perceive to configure parental control settings in Windows 8.1. 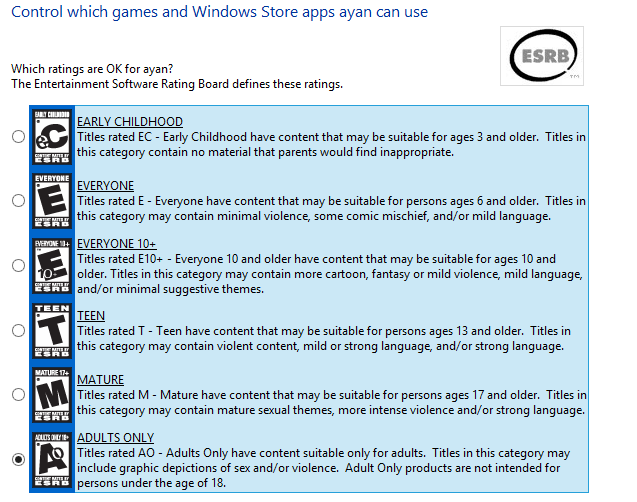 Microsoft has put this parental control feature in Windows 8 and 8.1 already. By using this quick guide you can restrict access of your children to crappy stuff available on internet websites with the use of family safety feature. How to Open Family Safety Settings? #1: Simply go to the search bar available in charms bar. To open charms bar take your mouse’s cursor to the top right of the desktop screen. 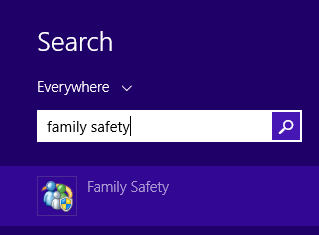 #2: After opening search bar, type “family safety” in the search bar and select family safety option from the below available results. 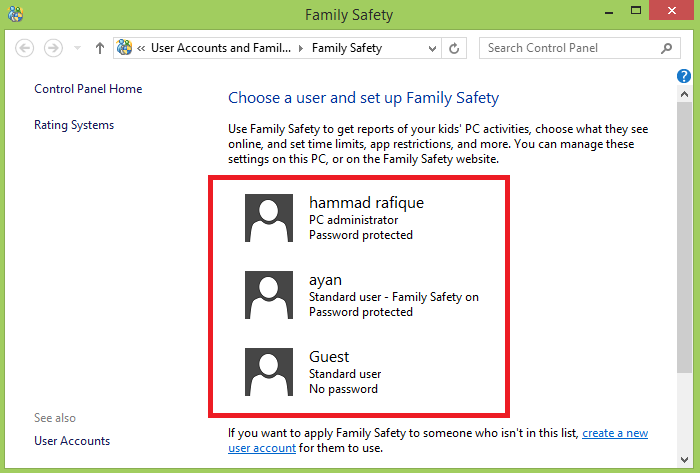 #3: Now select the child’s user account available in the family safety’s appeared window and if you can’t see users here, this is because of your PC is registered with family safety website, just remove it by clicking on “remove it from the family safety website”. Now you can turn on/off family safety option available on the user’s account window. After turning it on you can perform the below listed activities. You can view logs of activities done by your child in his/her Windows 8.1 account. With the help of this system you can monitor activities of your child on a daily basis and in case of any inadequate activity you can tighten controls upon your child. In this reporting system you can check, what websites were visited by your child, which software were downloaded from internet, which Windows 8.1 apps your child is using frequently and which games were played by your child. You can turn on/off these activity reports via user’s settings panel. Websites with explicit content can be blocked with the use of web filtering system. If your child is surfing adult websites intentionally or unintentionally you can block those websites in web filtering functionality. 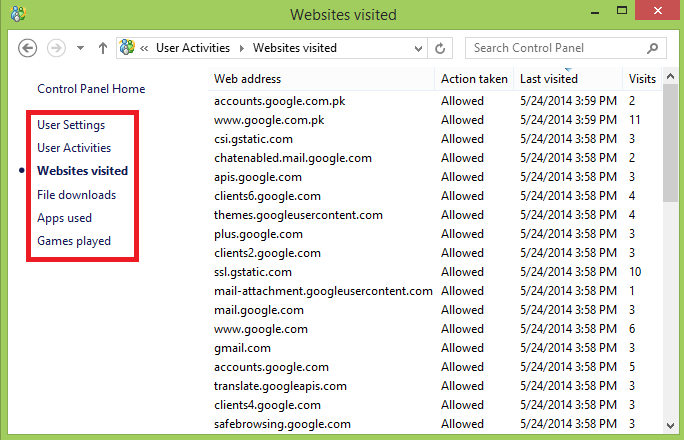 Also, you can allow few websites, so your child can only visit your allowed websites. 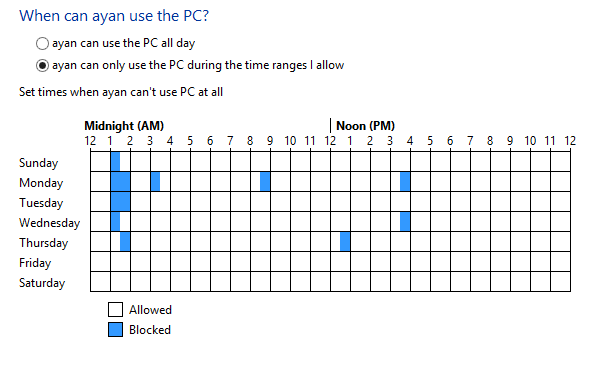 You can use this “time limit” feature to determine your child’s PC usage time. You can set predefined time in hours/minutes, when your child’s PC usage reaches this limit, the PC will shut down automatically. Also there is an option to set time limits for weekdays and working days separately. Furthermore you can set curfew timings for your Windows 8.1 PC for child user. At the time of curfew, the child user wouldn’t be able to use the PC at all. This function helps you to set restrictions for Windows apps’ usage. If you block child user from using any app, he/she will not has access to that app. 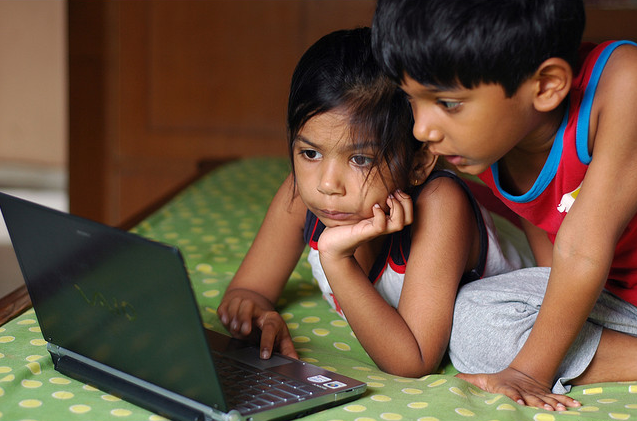 Hopefully, this article will helpful for parents who want to teach their children in a right manner and also want to stop them from doing inadequate things on internet. 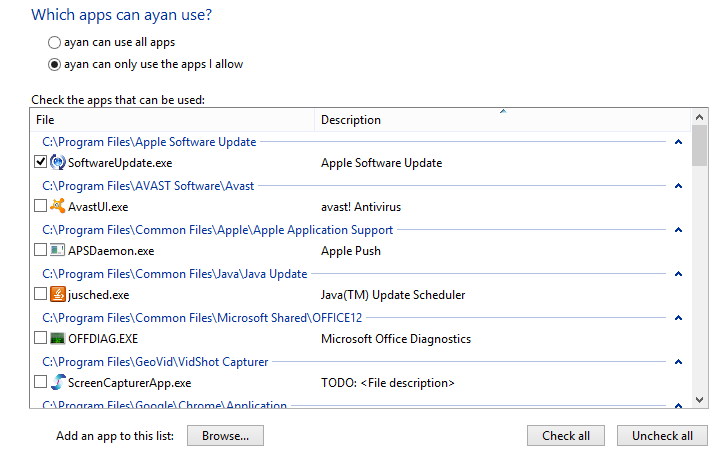 Are some of those features exclusive to Windows 8? They are very handy, and in particular the activity reports look good. I can’t remember seeing that as an option in Windows 7, or have I overlooked it? Yes james family safety feature was also available in Windows 7, but in Windows 8/8.1 it is more improved and effective to stop child user.